We are Security Professionals Developing Software Automation Solutions for Security Professionals. Lunarline Solutions offers a suite of Cyber Security Automation solutions that support your active Security Teams. These Solutions enhance the effectiveness of your security and privacy tool investments and reduce the time that your teams spend on these so they can focus on what matters most – Continually Improving Your Cyber Security Posture. Our Cyber Security Tools Work Together. Our security automation tools streamline compliance, enhance security operations and deliver actionable cyber intelligence to your security teams. If you ever used a vulnerability scanner, hardened a computer system, or conducted a penetration test, we have what you’ve been searching for and the solution you need. 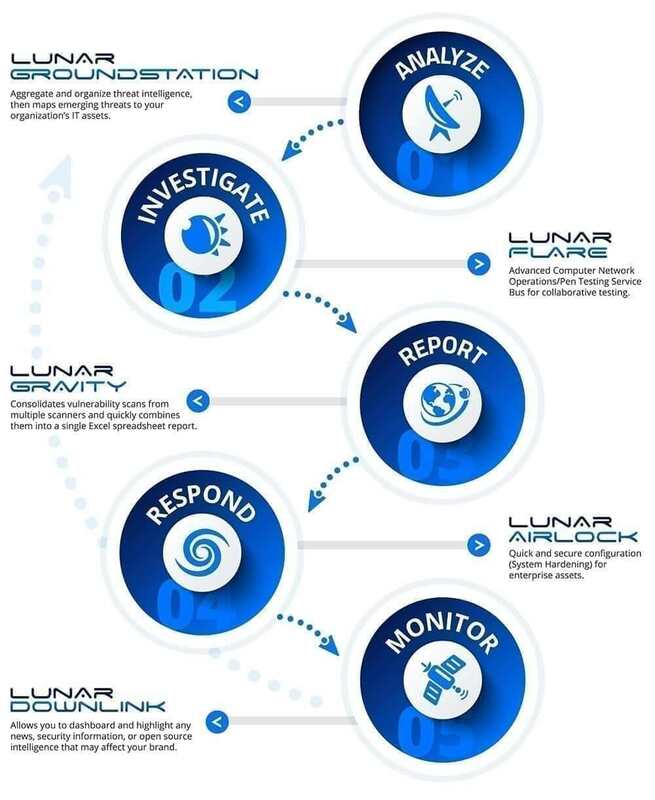 LunarAirlock automates the application of security configurations to computer systems. We provide scripts collections (called Locksets) that apply security configurations that align with DISA STIG baselines or other secure configuration solutions. LunarGravity saves you epic amounts of time processing the reports from your vulnerability scanners. Simply export your scan data to a LunarGravity compatible format like XML, and we’ll collect the data from each scanner into one, easy-to-read Excel formatted POAM. LunarFlare charges your penetration tests by providing real-time asset collection scans along with interactive vulnerability and exploit data. LunarFlare can even automate some of your exploits, giving you instant shell access to your targets. LunarGroundStation provides relevant threat intelligence at wire speed. By correlating threat, malware and vulnerability data with the assets deployed in your organization, LunarGroundStation enables you to prevent security breaches rather than reacting to them. LunarDownLink allows you to dashboard and highlight news, security information, or open source intelligence that may affect your brand. Contact Lunarline Solutions For Pricing at 571-481-9314. One of our Cyber Security Experts Will Help You. Companies find it more difficult each day to prevent infiltrations and penetrations of their systems. Malicious cyber attacks are becoming increasingly more frequent, successive and sophisticated. This problem affects every industry, our personal identity, our way of life, and the effect is global. Can your current cyber security solutions Protect These Constant Attacks? Contact us for an assessment of your current security posture. Cyber security is our passion. We help some of the world’s largest, most complex organizations fight back against modern cyber crime by strengthening their security and resilience. Our varied clients trust us to solve their most sensitive security issues. We do understand your situation very well and want to fight with you. We can solve your problems utilizing the latest resources and technology. You made the right decision by using our proven cyber security services. We are now able to constantly monitor your infrastructure. Through the design, deployment, operation and maintenance of your security and compliance programs, your security infrastructure is as safe as possible. Your systems are now secure and safe from current and future cyber attacks. Our experts are thoroughly trained to prevent any and all possible threats. Contact Lunarline Solutions at 571-481-9314. One of our Cyber Security Experts will be ready to assist you. ©2018 By Lunarline | Solutions Built on Security™ | All rights reserved | Privacy and Terms.